How to see history of images or videos I’ve grabbed? By default all the screenshots and videos that you captured are uploaded to our server and stored locally in your My Documents folder. Where %USERNAME% is name of your Windows 7 Account. To open folder with all you screenshots click on link Local captured files folder, Grabilla will close and open this folder in Windows Explorer. Another way to access your local captures folder is to use Tray button. Press right mouse button and select Local captured files folder. To locate your web captures history, please visit My Grabillas page, where you can find all your Grabillas and delete them if you want. You can install this useful Google Chrome extension called My Grabillas History for faster access to My Grabillas. 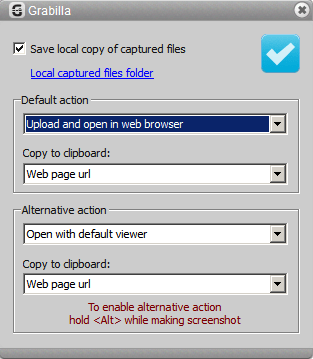 Another way to access your web screen captures history is to use Tray button. Press right mouse button and select My Grabillas (web history).